The hype surrounding Haruki Murakami’s first English fiction release in years is rising. International fans were given some reprieve from their Murakami withdrawal when the film adaptation of his iconic novel Norwegian Wood was finally released in cinemas worldwide earlier this year. Still, it’s been four long years since the last time a Murakami work, After Dark, was published in English in 2007. His latest masterpiece is 1Q84 (One Q Eighty-Four or ichi-kew-hachi-yon), a three-part novel, which will be released in English later this year in one giant 1,000-page volume. The book, published in Japanese last year, has predictably proven to be a massive hit, selling out within days and reaching sales of over a million in its first month alone. Indeed, the title is also a direct play on Orwell’s famous work, as ‘Q,’ or ‘kyuu’ is Japanese for the number ‘nine.’ IQ84’s plot follows a man and a woman, in search of each other, through alternate dimensions. The story also incorporates some cult-related themes. Dealing with collective trauma has become an important theme for Murakami. As he was finishing The Wind-Up Bird Chronicle in the mid-‘90s, Murakami’s writing began to explore more social and political events after he witnessed Japan being dramatically shaken up by the Kobe earthquake and the Aum Shinrikyo group’s gas attacks. This led him to produce his first work of non-fiction, Underground, for which he interviewed 60 survivors of the 1995 Sarin gas attack on the Tokyo subway by the radical cult. This was soon followed by a short story collection, After The Quake, which dealt with the aftermath of the Kobe earthquake. Although 1Q84 was written and published before last month’s tragic earthquake and tsunami, the theme of overcoming suffering will most likely resonate soundly with readers today, and we can surely expect Murakami to come up with a future work that will touch on the biggest crisis to hit Japan since World War II. 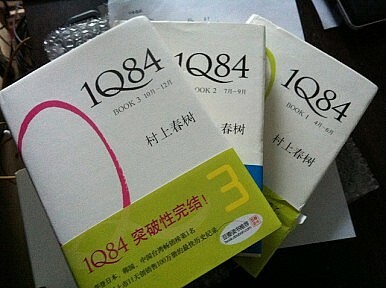 1Q84’s English version will be available starting October 25, 2011. The Murakami Factor Kenzaburō ŌeYasunari KawabataStorytelling, Cultural Spheres and the Senkaku DilemmaNobel in Literature: Could This Be Haruki Murakami’s Year?